We would like to say a few words about Srikhanda. The people of Srikhand traditionally are very devout followers of Lord Chaitanya and Lord Nityananda. And every year many of these great devotees from Sri Khanda would go to Jagannath Puri, and how Lord Sri Chaitanya Mahaprabhu would welcome them with such ecstatic love! He loved this village. This village was so dear to Lord Gauranga’s heart because of the great intimate devotees who were serving him here. One was Mukunda Sarakar. There were two brothers Mukunda Sarakar and Narahari Sarakar. Mukunda was the elder brother and he had a son named Raghunandan. And when he was just this small boy, one day Mukunda was called to do some of his medical work away from home. Now everyday in the temple of Sri Radha Gopinath… this deity was the family deity of Mukunda Sarkar. There is also a deity of Gopal there. So he would offer with his own loving hands bhoga to the deity every day. So one day when he was sent away, he asked his little son Raghunandan to perform the offering for him. So Raghunandan agreed. He gave him simple instructions. You bring the offering in, and you offer a prayer to Krishna to please accept this bhoga. So little Raghunandan brought the offerings in, on the plate made by his mother. And he said to Gopinath, “Please accept this offering.” And then he waited for some time. And he said again to Gopinath, “Please accept this offering.” And he said it again. And then he started to cry and cry and cry; with so much love and devotion he was crying. “Now Krishna always recognizes the tears of one who has Bhakti.”- Radhanath Swami. So Gopinath said to him, “Why are you crying?” He said, “Because I asked you to eat this food and you are not eating.” Gopinath said, “I already ate.” Raghunandan said, “But the food is still here.” He said, “But I ate through my glance. And the rest… this is remnants. This is Prasad.” And Raghunandan, he didn’t understand what is this philosophy about eating through eyes. So he continued to cry. And he said, “My Lord! Please eat this food. Will you not you accept it from me?” So just to please his little devotee, right in front of his eyes, he picked up the food with his hands and he ate it. Sri Gopinath Bhagwan ki Jai! This story took place here in Srikhanda; very powerful to purify our heart to hear this story in this place. Mukunda Sarkar understood that his son Raghunandan was a very, very special soul who had tremendous Bhakti. So he said, “I want you to offer this laddu to Gopinath, Gopal.” So Mukunda, from a secret place was hiding and watching. Of course Gopinath knew he was watching. But Raghunandan did not know he was watching. So he put the laddu down and he said, “Oh Gopinath! Please accept this Laddu.” And Gopinath with His eyes he ate it. But the Laddu was still there, because the Lord with all of his senses can perform the functions of all other senses. “This is the science of Prasad. When Krishna looks with his glance and he can taste the sweetness of the devotion of his devotee in which it was prepared and offered. And when he takes that he completely spiritualizes what is there with his own mercy, and therefore it is called Prasad. And that Prasad can purify your heart, because it is not different than Krishna.”- Radhanath Swami. So Gopinath performed this wonderful act of mercy. And Raghunandan again began to cry. And he said, “Please accept my offering Gopinath! Please!” And then, right in front of Raghunandan’s eyes, Gopinath reached down and ate half Laddu. But because he had just eaten shortly before, he left the other half. And Mukunda Sarkar was watching in great ecstatic love to understand – what kind of son I have! He is giving me Bhakti. So the news spread that Raghunandan Thakur was such a dear devotee of the Lord. And it spread to one very great and intimate associate of Lord Nityananda whose name is Abhiram Thakur, also known as Ramadas. What kind of devotee was this Abhiram Thakur! In Krishna’s lila he is Sridama, the younger brother of Srimati Radharani, and in Lord Chaitanya Mahaprabhu’s lila he was simultaneously an intimate associate of Lord Chaitanya as well as Lord Nityananda Prabhu. And when Lord Chaitanya Mahaprabhu was in Jagannath Puri, he told Nityananda Prabhu, “I want you to go to Bengal and preach Krishna Consciousness, give love of God to everyone without discrimination. And I am giving you my two best men to go with you- Abhiram Thakur and Gadadhar das.” And he gave so many others as well. Abhiram Thakur also had a whip. And the name of this whip was Jai Mangal. And anyone he would beat with this whip would achieve Krishna prema. Abhiram Thakur had very peculiar characteristic that he would bow down to deities or Shaligram shilas, and if Krishna wasn’t personally accepting worship through that Shaligram shila or that deity, the Shila or deity would immediately just crack into thousand pieces. And another thing: he would bow to people and if that person that he bowed down to even had one drop of material conceptions of a desire, that person would immediately die. Hare Krishna! 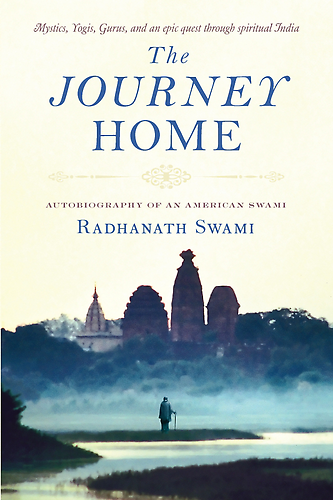 So when Abhiram was at the outskirts of town in Srikhanda, they took Raghunandan and hid him in a separate house in a private room. And Abhiram came to the house of Mukunda Sarkar where we just were. And he said to Mukunda and all the other relatives, “Where is Raghunandan? I want to offer my obeisances to him.” And they said, “He is not here. He is out of town. We didn’t know you are coming. So somehow or other he went to another place.”And he was sitting and he was very, very lovingly chanting the holy names of Krishna. 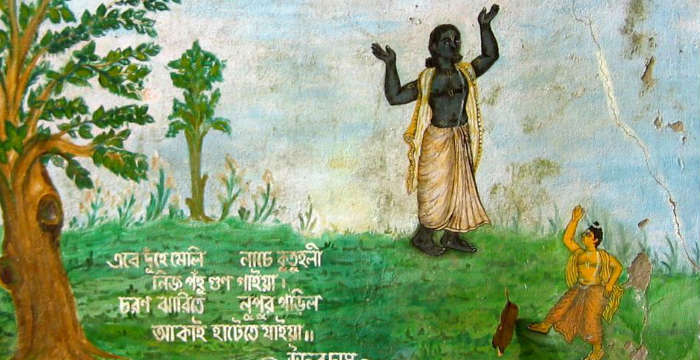 And as they were dancing, one of Raghunandan Thakur’s lotus ankles, they were dancing so ecstatically that it broke off and flew some miles away, through a village nearby, and fell into a Kund. And that Kund to this very day is called Nupur Kund. It is a very holy place. Srila Prabhupada discusses that Kund in Sri Chaitanya-Charitamrita. This is the holy place where Abhiram Thakur and Raghunandan Thakur danced in transcendental ecstasy. As we were explaining before, there was a tree, a Kadamba tree. And that Kadamba tree would grow two beautiful fragrant Kadamba flowers every single day just at the time when Raghunadan wanted to offer those Kadamba flowers to Gopinath. Srila Prabhupada explains that there are three types of services essentially, of devotees. And the Lord respects all of them equally if they are done with sincere devotion. One is the Grihastha who actually earns, but uses his wealth for propagating Krishna Consciousness. 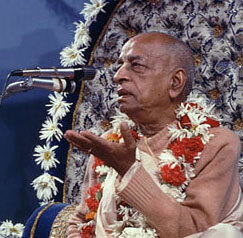 And also follows the principles of Krishna Consciousness very carefully in his own life. According to Lord Chaitanya, that is the perfect execution of the duty of the Grihastha. And there is also a need for brahmacharis who worship the deities. And there is also a great need for preachers who live in the ashram. Not only brahmacharis who worship the deities, but even people in homes who would worship their deities. And there is also a great need for preachers who live in the ashram, who live with other Vaishnavas. And they simply in that association spread the glories of the holy name around.